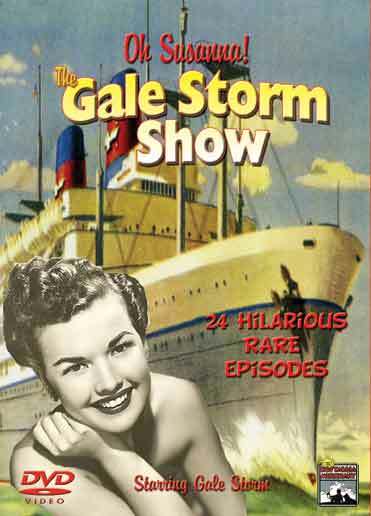 Gale Storm Show – Oh Susannah! Gale Storm Show – Oh Susannah! – Susannah Pomeroy is a cruise director on the S.S. Ocean Queen that travels around the world. Stopping at many different ports means many new adventures and interesting characters in every show. Zasu Pitts co-stars as Nugie, Susannah’s best friend. The Gale Storm Show, subtitled Oh Susanna, premiered on September 29, 1956 and ran until 1960 for 143 episodes. We have managed to salvage these 24 episodes from hundreds of damaged and poor quality prints. Full-length episodes and many of the shows include the original commercials. Year: 1956. Runtime: 720 minutes. This entry was posted in Nostalgia Merchant and tagged Adventure, Classic TV Shows, Comedy, cruise ship, Rare TV Classics.